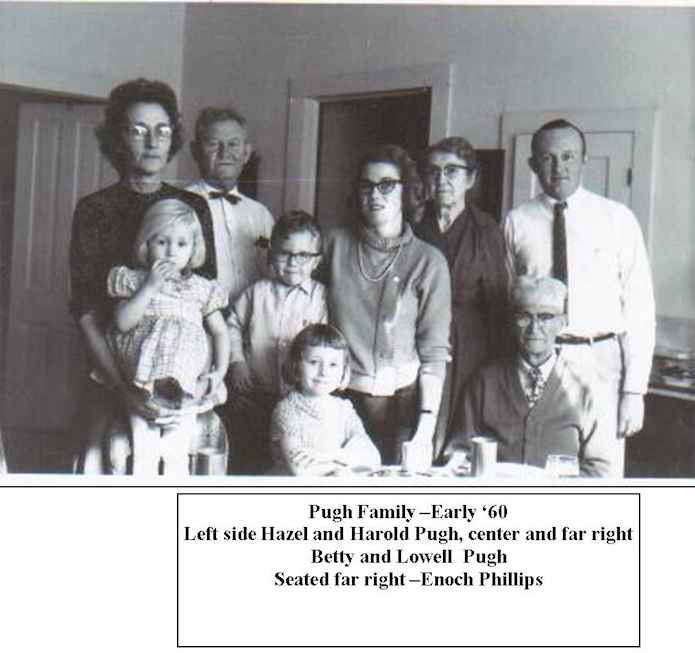 The history of Pugh Funeral Home began with Lowell’s great uncle, Enoch Phillips who started in 1904 and was later joined by Lowell’s dad and mom Harold and Hazel Pugh and later Lowell and his wife Betty. Golden City, Missouri is a small rural community in the Midwest. The initial business that contained the funeral business was a hardware store. Funeral establishments were usually connected with other business like hardware, furniture and even a wagon manufacturer. The first evidence of funeral activity in Golden City was found in 1882 with an advertisement by A. Morton who offered coffins for sale among other things and another advertisement from Perry Hurlburt having an undertaking business in Golden City. 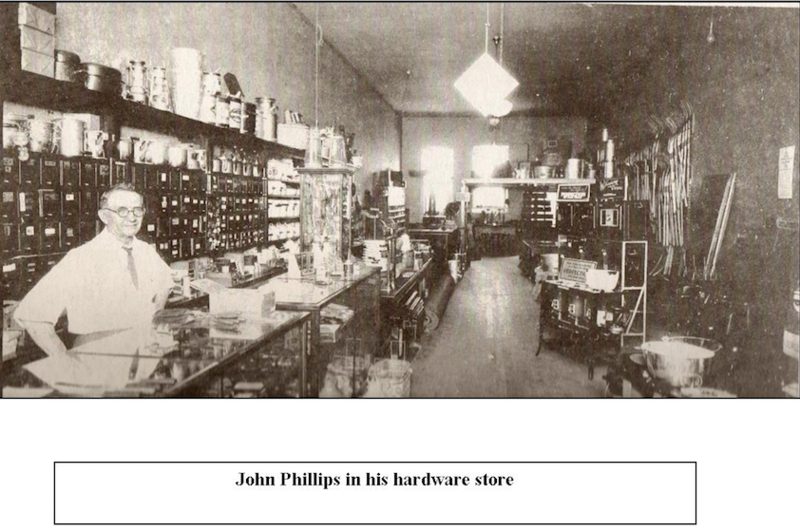 In 1904 James and John Phillips purchased a furniture and undertaking business from Udell & Finney next to their hardware business. This particular undertaking business had records from 1903 but their business could have been earlier. These two brothers were Lowell’s paternal grandmother’s siblings. They convinced their younger brother Enoch (E.A.) to take over the undertaking business, so he went to a three-day course in Springfield on embalming from August Lohmeyer, a Springfield undertaker and state board member. E.A. was granted Missouri embalmer license No. 802 in 1904. Caskets and coffins (coffins are larger at the shoulders and narrower at the foot versus the caskets) were kept upstairs in the hardware building and a matched grey team of horses were in the barn behind the store. Embalming was done in the home of the client. Most of the finished caskets were bought from Kriegle Casket Company in St. Louis and Abernathy Furniture and Casket Company in Kansas City. The Phillips Funeral Home’s first sale in 1904 was a five-foot, nine-inch, black crepe Kriegle casket for $25.00, slippers for $1.17 and an $8.00 hearse charge. An interesting fact was that many of the bodies were received by trains. This mode of transfer discontinued when passenger service stopped in the 1960’s. The bodies traveled in the railway express cars (those that were attached to passenger trains). Most bodies were received on the 3:30 a.m. Express from the west. They were all embalmed bodies, casketed and in heavy wooden shipping boxes that were used to bury them in. It took several days of rail travel to reach the depot for pick-up. Funeral home personnel took the bodies directly to the grave or storage (when the bodies were received in the early morning) until services. In 1919, E.A. 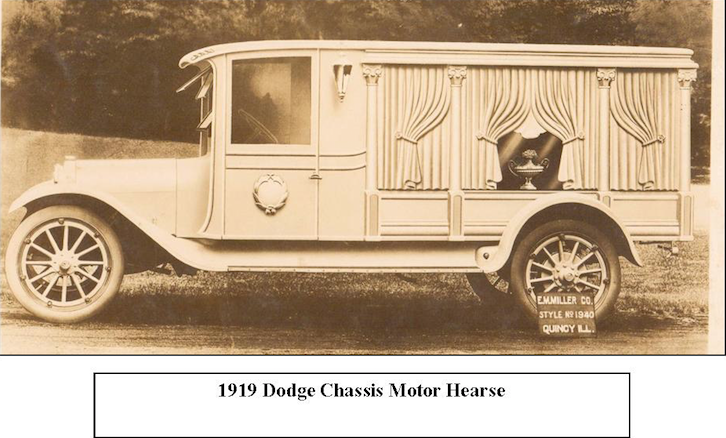 took a train to St. Louis and returned with a Dodge chassis motor hearse. 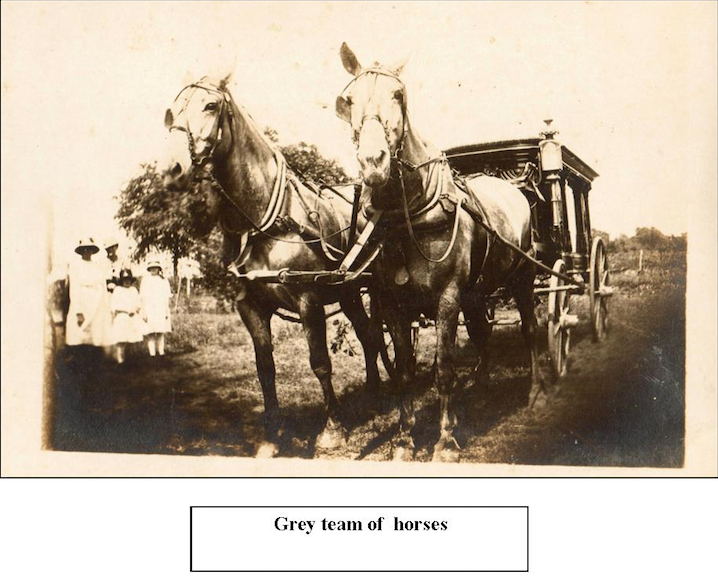 The matched grey horses were relegated to dray duty. The Dodge hearse was an instant success even though a country funeral in muddy weather took all day and several stops to refill the radiator with water from a ditch. Besides the embalming taking place at the homes, during some of the past epidemics the funeral home provided fumigating of the houses to rid it of the contamination. One instance when every window was closed and doors plugged up to keep the fumes inside to do the germ killing, it almost killed the family cat who had not made it out before the process began. Uncle Enoch kept looking for what was making the noise inside just as the cat came crashing out of the bay window glass to survive. 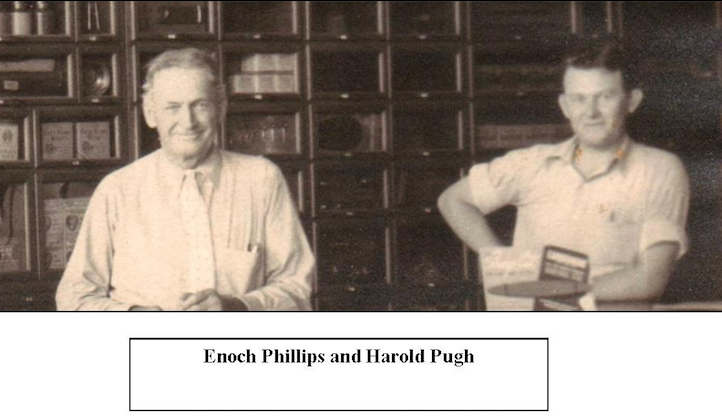 Lowell’s dad Harold F. Pugh started working for his uncle in 1922 at the age of sixteen, graduating from the Williams Institute of Embalming in Kansas City in 1928. At this time funeral homes had become involved with providing ambulance service. The Phillips Funeral Home began their ambulance in 1928 with a 1928 Meteor combination funeral coach/ambulance. In the 1920’s they had purchased a store front building and they had a viewing area and embalming was done there. Caskets were also displayed in the building. 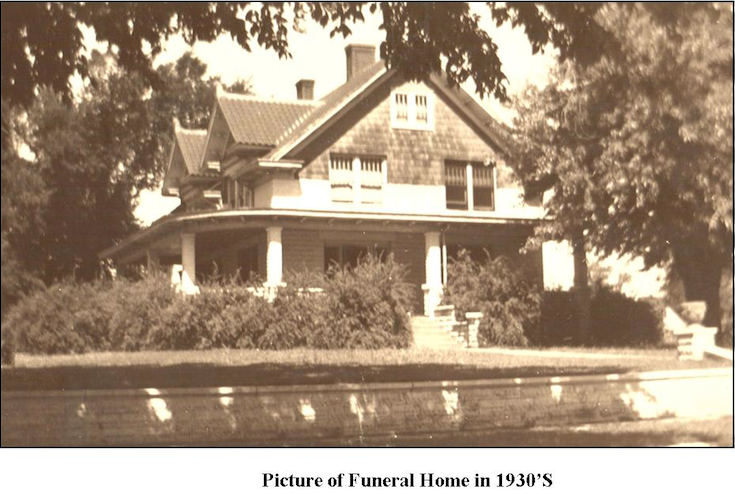 The actual funeral home was purchased in 1931 as a residence and business. After renovations of the house included converting a bathroom to a preparation room and putting in an elevator shaft, they moved the funeral operations out of the store front. An interesting aspect in the 1930’s and 1940’s was how the accounts receivable are littered with entries describing unusual payments. These include pay by produce, animals and labor for wallpapering to gathering corn or sowing seed. At this time the casket selection dwindled to an assortment of cloth-covered, one hardwood and one 20-gauge half couch due to the economic times. Some difficulties in World War II came with the tire and gas rationing. Initially the funeral home‘s low priority sticker for fuel had to be appealed because of the various needs. Then with tires scarce and in poor condition, they didn’t even last one trip for a pick-up. This was a different challenge. These shortages also had an effect on the products used in funerals for example steel vaults. E.A. had always buried his family in steel vaults which were not available for purchase during the war because all steel went for war efforts and so he held one back for himself. Interesting, considering E.A. didn’t die until 1965. Lowell began his career with the funeral home at the age of 12 as an ambulance attendant. This led to first calls, yard work, helping with funerals and setting up cemetery equipment. Many individuals began their careers in similar ways. 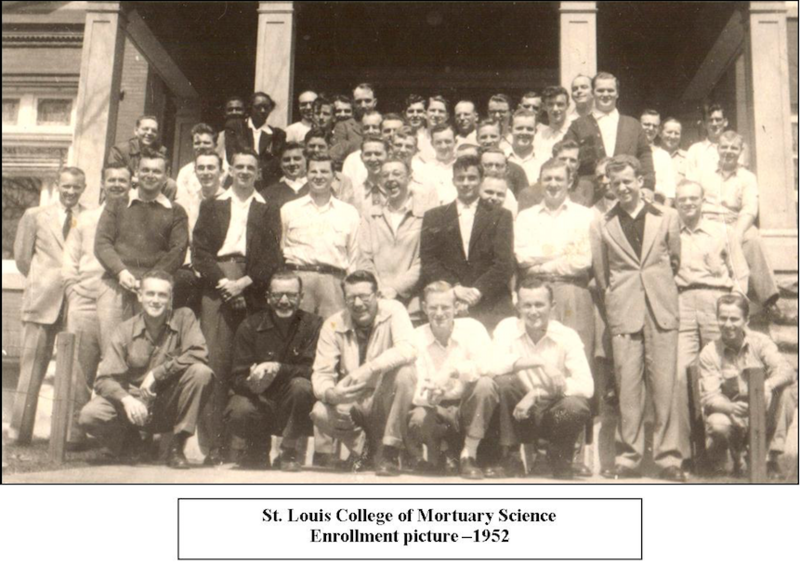 He officially started his apprenticeship in 1951 and graduated from St. Louis College of Mortuary Science in 1952. After a small detour in the U.S. Army, he took his oral exam on furlough and received his embalming license after shipping out to Germany in 1954. Upon his return from service his began his funeral service career fulltime at home and at another local funeral home in another town. Throughout the years he continued his hardware business with the funeral home until the 80’s when he closed the hardware business, but he saw many changes in the funeral profession: from the variety of products now offered, to the beginnings and continuing problems of providing preneed arrangements for his customers, to the continual changes in the field of technology. Technology has changed how products such as memorial folders are produced, how services are presented from actual people to now sending them over the internet. Other factors in our business that have changed include the rise of cremation and the emphasis on memorialization and personalization. Lowell was assisted by his wife Betty until they both became semi-retired in early 2000’s after several health issues. Joanne Howard joined the funeral home family in 1992 as a funeral director. She is now the funeral director in charge and manager. When additional help is required, Daniel Funeral Home in Lamar, Missouri and Springfield Mortuary Service in Springfield provide assistance along with Knell Mortuary in Carthage, Missouri. In 1995, Lowell and Joanne wrote a continuing education program “Grief Resolution for Co-Workers” that had been approved in approximately 20 states. Also they collaborated to produce several other articles published in various magazines. In 1999 they began their own funeral-related magazine called “The Dead Beat – The Caregiver’s Soapbox.” It is published bi-monthly and is sent to over 3900 funeral homes and mortuary services in 11 states and is still being published. Check out www.thedead-beat.com. Pugh Funeral Home strives to provide all its customers a comforting experience in their time of need today as they have in the past.